Don’t feel like trekking up and down the stairs with a screaming baby with every dirty diaper? Yeah, me neither. Changing tables are great, but the reality is you won’t always be in baby’s room. That’s when diaper caddies come in handy. Caddies make diaper changes mobile and keep everything you need all in one place. After reading this guide, we’re confident you’ll be able to find a diaper caddy that’ll make life convenient and organized, with every diaper change. Use the links above to check the latest prices or read our in-depth diaper caddy reviews below. What Should I Store in my Diaper Caddy? Can I Just Use a Storage Container I Already Have? The first step in choosing a diaper caddy is deciding what type you want. 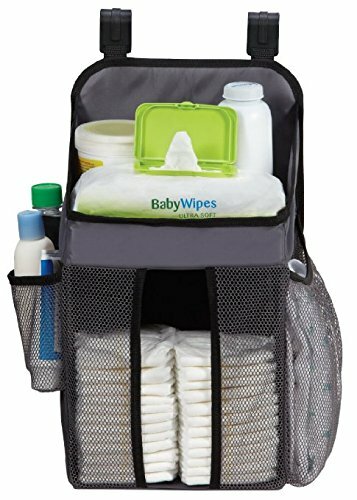 Portable caddy: This is the most popular type of diaper caddy today, as most parents love being able to easily move it from room to room, or even use it for travel. Portable caddies are usually small with a handle and have enough space for supplies for a day or two. Hanging caddy: These type of caddies hang on playards, cribs, walls, and in closets, and while they are technically portable, they aren’t the easiest to transport, so many parents just leave them in one place. Hanging caddies are generally larger, so they can hold more items than other caddies, but still free up space in the nursery. Stationary caddy: These are the least common type of caddy, as they are meant to stay in one place and take up space on the changing table. They do make organization much easier though. 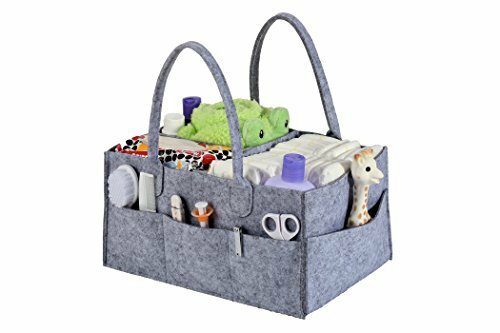 If you have the extra space on your changing table and don’t mind going to the nursery for diaper changes, then this may be the type of caddy for you. After you decide what type of caddy you want, some other key features will help you decide which caddy is best for you. Cost: You will need to factor in the cost of your desired caddy into your budget. You may need to settle for a lower price if the money just isn’t there. Material: Diaper changes can get messy fast, so you will probably want your diaper caddy to be made with easy-to-clean materials. The best ones are made from plastic, polyester, or stain-resistant materials. Many caddies today can be easily spot cleaned or thrown in the washing machine (source). Size: Do you want a small diaper caddy that doesn’t fit a whole lot, but can easily be tucked away out of site, or would you rather have a larger caddy that can fit multiple days worth of stuff? Remember: You will definitely need a larger caddy if you’re having twins or planning on using cloth diapers. Color: Would you rather have a gender-specific color like pink or blue, or do you desire something unisex that will look good in any room and can be used for multiple children? Storage space: The amount and size of storage is always a key factor in finding a good diaper caddy. When searching for caddies, be sure to think about what you want to store in it and assess the number of compartments, pockets, and shelves to see if it matches up. The less separation a caddy has, the harder it will be to find items you need and that will make diaper changes longer and stressful. Sturdy handle: Pick a portable caddy with a sturdy handle, so you can easily grab it when you’re in a hurry. It’s even better if the handle fits over your shoulder, as this frees ups both your hands for your baby. If it includes a changing pad: Choosing a caddy with an included changing pad will mark one less purchase off your list. However, many moms are fine with using prefolds, burp cloths, or a receiving blanket as a changing pad. Babies have a knack for bringing a little mayhem to even the most orderly life. If you’re anything like me, the right storage and organization solutions are the things bravely standing between you and total baby chaos. A good diaper caddy keeps things neat, tidy, and calm, no matter what your baby throws your way. If you’re having twins, you’ll need a caddy with plenty of space for double the amount of diapers and wipes. You’ll want a large enough caddy that will fit everything you may need for both babies, so you won’t have to end up purchasing two separate caddies. Simplify your double duty diaper changes with the Good Baby Diaper Caddy. This caddy is available in two different sizes, with the regular measuring at 13” x 9” x 7” and the large at 16” x 10” x 7”, making it a great option for a single baby or twins. It comes with plenty of compartments for storage, and the inner insert is removable, so you can customize the caddy to your twin needs. There are eight exterior pockets, where you can store your twins’ pacifiers, small toys, diaper cream, and other small items. The Good Baby comes in a neutral grey color and design, so it will be sure to compliment any room decor. This caddy is so versatile, it can solve many of your other storage needs. It even works great as a nursing station organizer, so you can easily carry your breast pump and accessories around the house. Some parents have found it flimsy. Some parents are not fans of the material. Keep all of your diaper essentials easily accessible, but out of the way with the Hiccapop Hanging Nursery Organizer. You can have all your diaper needs neatly organized, while freeing up space on top of the changing table. This caddy quickly attaches to changing tables, cribs, or walls. There are 3 straps with buckles for attaching, which allows for more weight to be held. 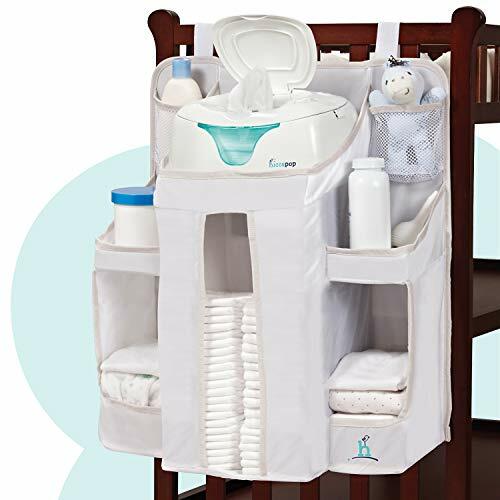 This caddy includes 2 pockets and 6 shelves, including one designed to hold a large wipes container and an extra long one that can hold up to 72 diapers. The Hiccapop is available in two gender neutral colors, white and charcoal gray, and is made with washable and stain-resistant material, so you won’t have to worry when a diaper disaster happens. Straps aren’t long enough for some cribs with very thick rails. The Munchkin Diaper Duty is an awesome tabletop organizer loaded with various compartments of all sizes. Set this plastic, stationary caddy up in your baby’s room so you can be fully prepared for a quick diaper change. This caddy features a large, flat top that will accommodate a wipe container or even wipe warmer and slots in the front for several diapers. 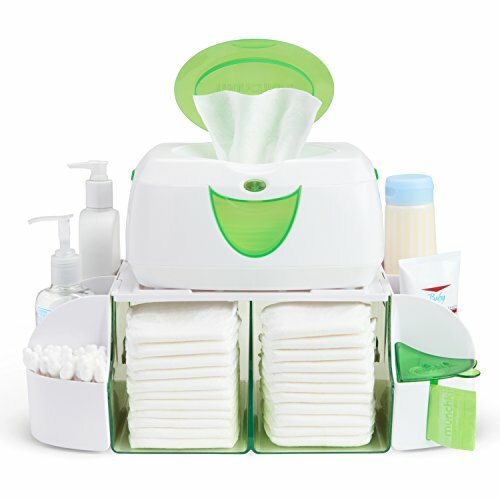 The side bins are removable and great for organizing diaper creams, lotions, cotton balls, and more. Since this caddy is made out of plastic and the bins are removable, cleaning is easy peasy. You can even just rinse it out in the sink or the shower. If you have a small house and some extra space in your baby’s room, then this tabletop organizer is probably the perfect fit for you. Includes 12 scented diaper bags with purchase. Wipes warmer pictured is not included. Some parents found it to come apart easily. If you’re looking for a caddy for your cloth diapers, you’ll need something large enough to fit all that fluff. You will also probably want compartments for your cloth wipes, a spray bottle, and diaper cream. This caddy measures 14” x 10” x 7”, making it larger than most diaper caddies, which is great for storing your fluffy cloth. It even comes with two removable inserts, so the compartments can be made even larger to fit more cloth diapers in it. There are also eight exterior pockets, perfect for storing nail clippers, toys, a hair brush, a thermometer, and more. It is made out of durable suede and comes in a nice light grey gender-neutral color, so it will look good in any room and can be used for multiple children. 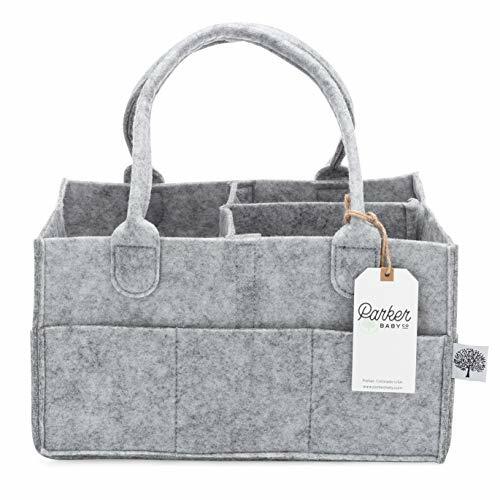 This caddy is so stylish and functional, you’ll probably even want to buy another one to use as a storage bin for toys, sewing supplies, or a car organizer. Some parents aren’t a fan of the suede. 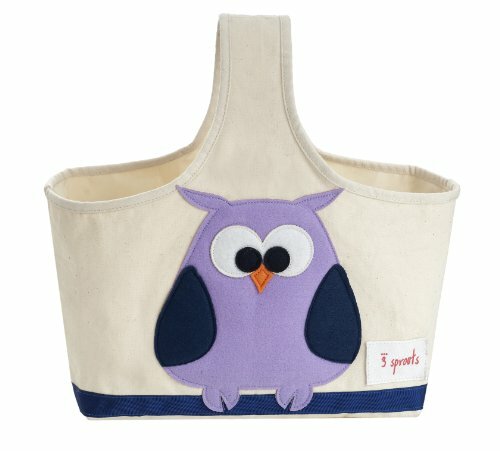 This cute and simple tote makes diaper organization fun. It comes in eight different animal prints that will look adorable in any nursery. The outside is made with 100 percent cotton, and animal print is made with 100 percent polyester. The interior is coated with vinyl/plastic material, making it easy to wipe clean in the event of a spill. Your diapers, wipes, and diaper cream will fit well in the center, and there are three pockets along the back for storing smaller items, like nail clippers and a thermometer. The firm, wide handle makes it easy to throw this caddy over your arm and move it from room to room. This caddy is so cute and functional, you could also use it for sewing supplies, arts and crafts, books, bath supplies, or toys. Some parents find it too small. This handy caddy is easy to grab and move from room to room. It’s the perfect size with just the right amount of room to store your diapers, wipes, and more. It even comes with a color coordinated changing pad, so you won’t have to worry about getting poop on your carpet. The JJ Cole features two deep interior compartments that have ample space for diapers, a wipe case, baby lotion, and a small toy. It also has a drawer in front that’s perfect for storing nail clippers, cotton balls, and diaper cream. There are rubber feet on the bottom, so you won’t have to worry about the caddy sliding away while you’re dealing with a poopy diaper. 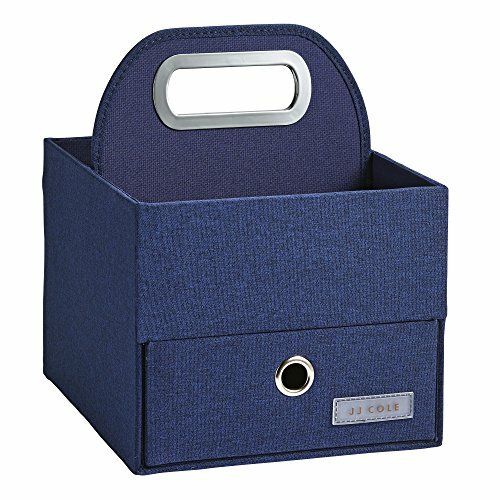 This caddy is available in navy and slate colors and so stylish that you’ll be able to use it as a storage bin for toys, art supplies, or even your mail when you’re out of the diaper stage. JJ Cole also has coordinating items available for sale, including a hamper, storage boxes, and under-bed organizers, so the whole nursery will be fashionable and organized. Not a great choice for cloth diapers. Some parents have found the handle bends. If you want to know where everything is at all times, a hanging diaper caddy may just be right for you. You will want a caddy that easily hangs on your playard, crib, or wall without damaging it and will need plenty of space for all the essentials. This hanging caddy easily attaches to any playard and has plenty of spaces and slots to help you keep everything organized. Some parents have even been able to attach it to their baby’s crib. There’s an extra large shelf on top to hold your wipes or even a wipe warmer, a large center pocket for diapers, and two side pockets for your diaper cream, lotion, a change of clothes, burp cloths, and a toy. The pockets are mesh, making it easy to keep track of your inventory so you won’t end up empty-handed during the middle of a diaper change. We had this caddy attached to our Pack n’ Play when our little one was a newborn, and it made diaper changes so much easier. Our newborn cloth diapers fit well into the center pocket, and the top shelf was perfect for storing our spray bottle and cloth wipes. Stores more diapers than other caddies. Some parents found the top shelf flimsy. If you love style, you’ll adore this posh, but functional diaper caddy. 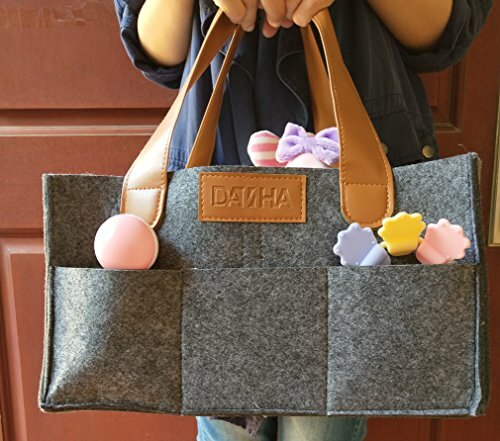 The Danha Storage Basket will make sure you have everything you need within arms reach for a hassle-free diaper change. There are three interior compartments for storing diapers, wipes, and a change of clothes, and several exterior pockets for organizing smaller items. This caddy is beautifully designed and made with high quality felt that is easy to clean with a damp cloth. The strap is made of leather and is long enough so you can easily throw the caddy over your shoulder, freeing up both of your hands for your baby. The neutral color is great for boys or girls and even dad won’t mind using it. You can plan on using this caddy for multiple children and using it as a toy or travel bag once you’re all done with the diaper stages. If you’re looking for a caddy you can take pretty much anywhere, you’ll need one that collapses, but still offers plenty of storage space. You’ll need something versatile and easy to clean while traveling. 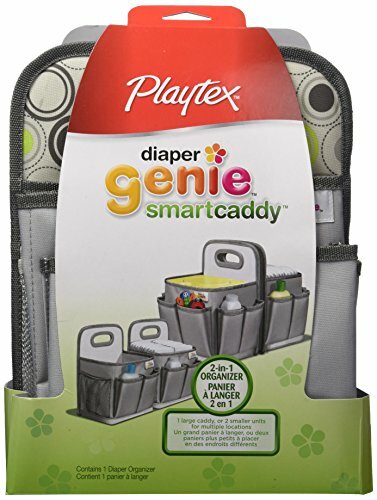 Conquer diaper changes on-the-go with the Playtex SmartCaddy. This adaptable and portable diaper caddy consists of two 6” x 9” bins that can be velcroed together to create one large 13” x 9” storage bin. Use one organizer for home and the other for travel. You could also even devote one for all your bath time needs. 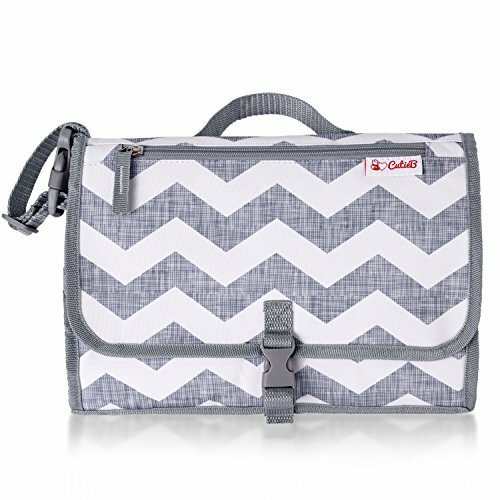 This caddy offers plenty of outside pockets to store all the smaller baby essentials. The material is water resistant, so it’s easy to wipe clean when you have a mess on your hands. This caddy is great to have in the car, but once you get to your destination, you can easily stand it up, hang it on the crib, or in the closet for quick access to all your baby’s items. Some parents have found the velcro to not hold well. Investing in a changing station plus storage caddy combo marks one less purchase off your list. If you’re in search of a combo system, you’ll need something where you can easily carry the pad and storage compartment together. This handy clutch is ideal for traveling or everyday use. It’s easy to carry around the house, throw in the diaper bag, or clip to the stroller. It’s portable and has enough storage space that you could easily use this instead of lugging your whole diaper bag around all the time. The CutieB is a 2-in-1 diaper bag which features multiple storage pockets, elastic storage straps, and a changing pad. There’s plenty of room for diapers, wipes, diaper cream, a small toy, and some of mom’s essentials. Plus, you won’t have to worry about your baby resting on germy surfaces or getting pee or poop on your floors. 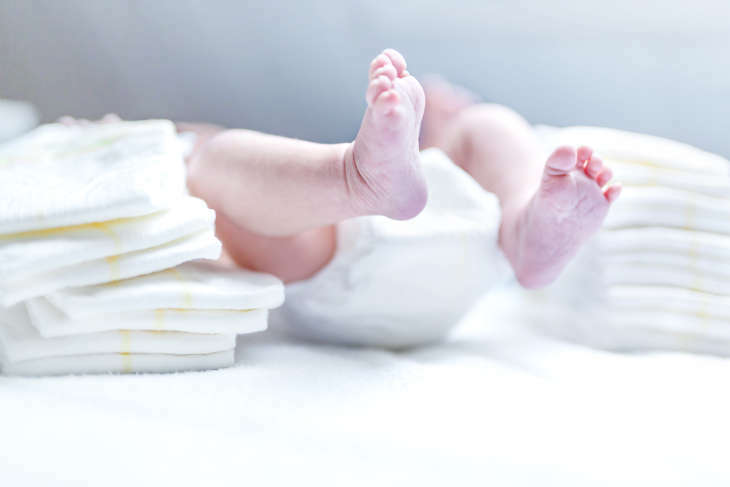 The changing pad is detachable and made with eco-friendly waterproof polyethylene vinyl acetate (PEVA), so you’ll be able to wipe it clean anywhere you are. It also features a nice head cushion, so you know your baby will be comfy during changes. Folds out with one hand. Not ideal for cloth diapers. Changing pad not very large for older infants/toddlers. What you store in your diaper caddy will probably change as your baby grows. You will want to store whatever you think you’ll use for your baby on a daily basis. Spray bottle, if you use cloth wipes. Changing pad, cloth, or receiving blanket to change baby on. A toy or two to keep your busy bee distracted. If money just doesn’t allow for a diaper caddy, try not to fret. There are other organizational options. You just have to be a little creative. Search around the house to see if there’s a storage bin that’s not getting used or sew your own. Some moms will even use a cleaning caddy, a shower caddy, or a little mesh dollar store caddy. If your storage solution doesn’t have any compartments to it, you could always repurpose makeup or travel bags to organize your essentials (source). Being a cloth diaper mom, I fell in love with the Stuff Me Baby Diaper Caddy. This caddy was perfect for storing both our newborn and our one-size cloth diapers, plus our cloth wipes, a spray bottle, and some hand sanitizer. I loved being able not to have to go to the nursery every time my little girl had a dirty diaper. Plus, this diaper caddy is really going to come in handy when I have to keep a close eye on my toddler while changing my newborn. Once you figure out exactly what you need to store, you’ll be able to find the perfect caddy to keep diaper changes organized and hassle-free. Super organized moms, now’s your time to share your secrets for keeping diaper changes slick and low-drama. As always, we love to hear your feedback in the comments!